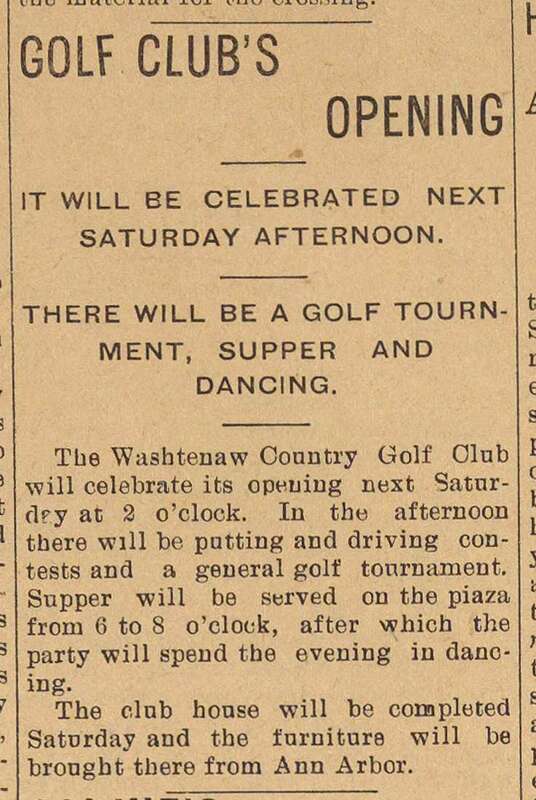 The Washtenaw Country Golf Club’s grand opening was covered by the Ann Arbor Argus-Democrat on August 25, 1899. The Washtenaw County Golf Club will celebrate its opening next Saturday at 2 o’clock. In the afternoon there will be a putting and driving contests and a general golf tournament. Supper will be served on the plaza from 6 to 8 o’clock, after which the party will spend the evening in dancing. The club house will be completed Saturday and the furniture will be brought there from Ann Arbor. The Washtenaw Country Golf Club was formally incorporated on July 18, 1899. Washtenaw Country Club still exists today, although it is now a part of the Polo Fields Golf and Country Club. 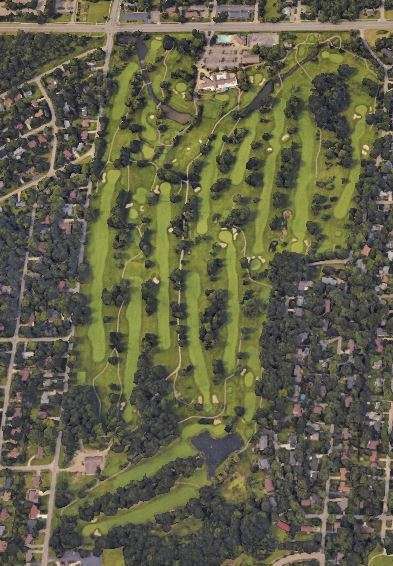 Washtenaw Country Club is one of the oldest golf clubs in Michigan. The oldest is likely the Charlevoix Golf Club, a nine hole affair that was designed by Willie Watson and opened in 1896. Washtenaw may be the fourth or fifth oldest in the state. It is likely the third oldest eighteen hole course, after the Detroit and Saginaw Golf Clubs. There’s actually a bit of a controversy between the Washtenaw Country Club and the Ann Arbor Golf and Outing Club as to which is the oldest in Washtenaw County. Washtenaw’s incorporation date is earlier, but Golf and Outing say they were playing informally before that. Washtenaw is “going public.” The Polo Fields is going to open up Washtenaw to daily fee players this year. I think that is great for we local golfers as the course is a lot of fun and frankly, better than Polo Fields Ann Arbor in my opinion. I heard that rumor last fall, but have not seen anything written anywhere. Do you know anything about prices/times available? I spoke with a Polo Fields representative at the Golf Show. Washtenaw is allowing public access while Ann Arbor is still private. The members will continue to get preference if they want to play Washtenaw. I don’t really know more than that. I think I gave them my email address as part of a “contest/drawing” and presumably I will hear something later this spring.